The MCU director talks besting the Russos and bringing crazy ideas to life through VFX, with a look behind key scenes from the superhero sequel. This article contains spoilers for Ant-Man and the Wasp. With audiences increasingly numbed to VFX work on the big screen, it's hard to say which CGI sequences from the past few years have struck cinema goers the most; one huge contender though must be the blowing up in size of superhero Ant Man during the multiple-hero fight scene from 2016's Captain America: Civil War. 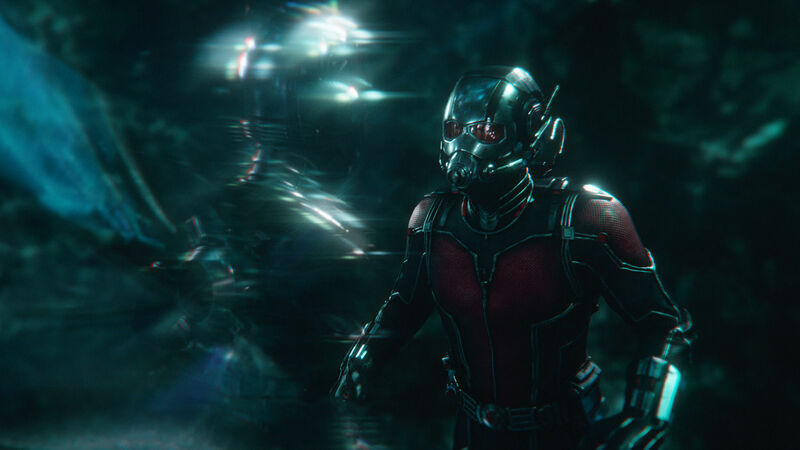 The scene exemplified Ant Man's unique place in the Marvel Cinematic Universe as the sole bastion of Steve Ditko-goofiness and visual playfulness, and it's that same brazen spirit that runs through Ant-Man and the Wasp, this year's sequel to the eponymous 2015 film that first debuted the size-bending alter ego of Scott Lang. Both films were helmed by Peyton Reed, who told Digital Arts on a recent press trip to the UK about his very strong desire to test the limitations of VFX work. "Part of my job, and Marvel tells you this, is like, 'Come up with the crazy ideas, even if you have no idea how to shoot it whatsoever,'" the director reveals. "There are plenty of things that we start out with that I have a version of how I think it's going to go," Peyton continues, "but Stephane Ceretti, our visual effects supervisor who did the first Guardians of the Galaxy and Doctor Strange, and who's been nominated for two Oscars, he's a man who doesn't like to say no. He likes to figure it out, and he likes to work with people who can help him figure it out." Some of those people include LA-based Method Studios, who were tasked with creating the Quantum Realm, a magical alternate dimension that defies the law of physics. To depict the Realm on the big screen, Method worked with Peyton and Stephane to shoot the actors on a flat, dirt landscape, which Method then transformed into an undulating surface through multi-layer simulations. The section of the Realm our heroes travel to is actually one of many, one defined by Peyton as a wasteland. "It was creating this internal logic about the different levels of the Quantum Realm, and that was sort of the closest that (the characters) could get up to, just on the other side of the void," he explains. "But also there's the idea that if you go deeper in past the wasteland, that maybe there are other parts of the Quantum Realm to investigate. 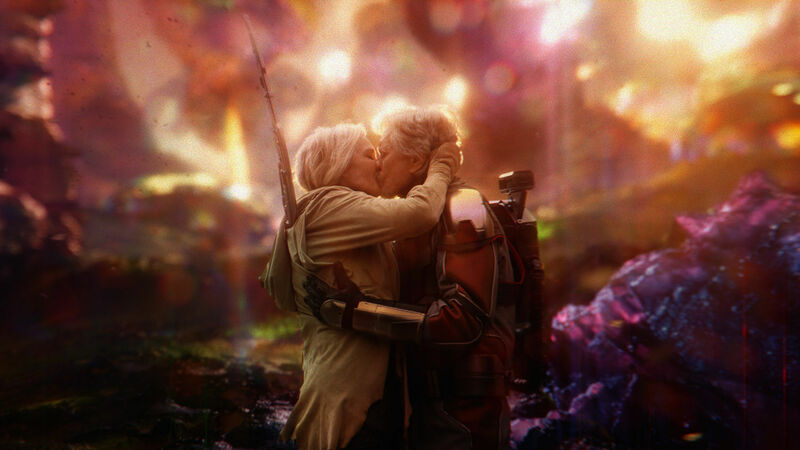 And in fact, if you're sharp-eyed, there's a shot in the movie when Hank Pym and Janet van Dyne are exiting the Quantum Realm where you may be able to see a glimpse of some other areas of the Quantum Realm," Peyton teases. Access to the Realm revolves around a 'quantum tunnel', as created with the efforts of California's Luma Pictures. For the sequence involving the tunnel, Luma digitally recreated an entire environment, with a look designed from heavily treated 3D passes and plates. The end result is meant to represent a 'version 1.0' of the tunnel, one that is "imperfect, messy and...meant to run out of control and explode,” to quote Kevin Souls, VFX Supervisor at Luma. Working with Stephane, the Luma team wanted to explore the idea of an effect that would feel purely optical and use distortion instead of energy, all the while maintaining a feeling of force and power. "There's so many visual effects," Peyton says about the film. "There's almost 1,800 visual effects in it, so they want to do new, weird things and try and break ground." Not that Peyton found such an amount of VFX work daunting. "I'm really hands-on with visual effects, because I've had smaller visual effects in movies and TV stuff I've done before," he explains. "As a kid, I was someone who subscribed to Cinefex magazine, so when the time came, I did know a lot about it." 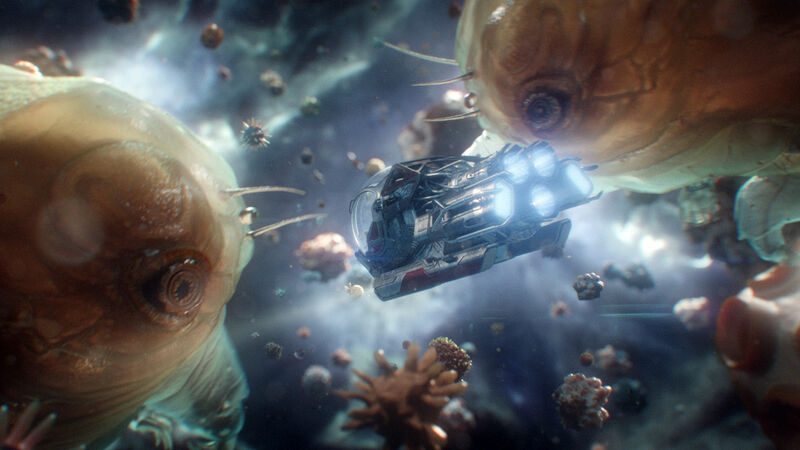 Peyton's greatest desire with Ant-Man and the Wasp though was to make location more of a character, with as much realism that could be possibly allowed with VFX compositing. "One of the things I wanted to do a little differently than the first Ant-Man was to open it up and feature the city of San Francisco as more of a character," he tells us. "I wanted to shoot not at night and in the rain, but in broad daylight, and have Giant-Man and Ant-Man and Wasp going around the city, and to try and make it look as photo-realistic as possible." "If you're looking at something that looks like, 'Oh, this is what it would be like if I were sitting in Starbucks and Giant-Man was going down the street trying to stop a truck,' that gets really exciting for me, so that was kind of the biggest challenge." That size-shifting collision between the mundane and the surreal is what defines the Ant-Man brand, and the new sequel has its fair share of special effects moments that veer away from the apocalyptic destruction and almighty punch ups template of most Marvel fodder. One example is a more comedic scene when Scott’s suit malfunctions and he’s stuck at the size of a preschooler, the creation of which was developed with the aid of Method. The scene was shot practically with a dual camera rig and married with mocap data of Paul Rudd (Ant-Man/Scott Lang). Stephane chose to shoot the scene with grey screen; this approach allowed artists to more closely match the on-set lighting. 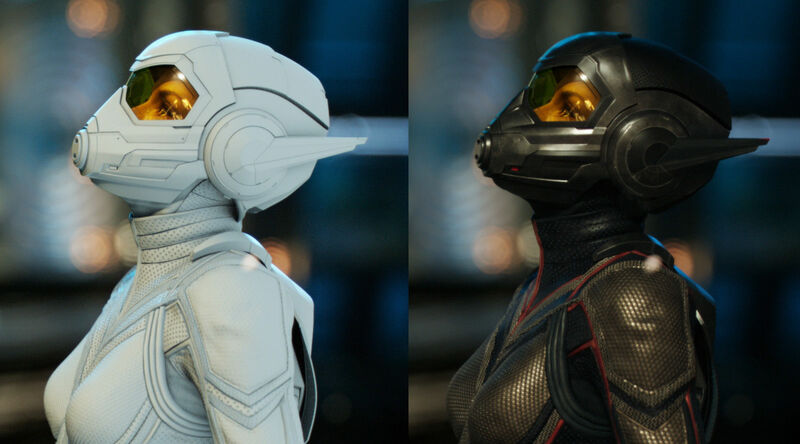 Method also created digital doubles for both Ant-Man and fellow hero Wasp that were used when each of them were either small or transitioning in size. Regardless of scale, Method artists generally kept the same level of detail on the suits. When full scale, the suits are mostly practical, though the helmets remain CG throughout. A similar scene has Ant-Man hiding in a small broom closet, when suddenly he has an issue with controlling the size of his suit. The idea behind the sequence, as put together by Luma, was to use an old technique called forced perspective, aided by modern technology, to achieve the visual gag of the giant-sized Ant-Man literally bursting at the seams of the closet. To accomplish this, all the plates were designed to be shot independently and then assembled in the compositing process. The character of Ant-Man was shot in a green screen scale model of the room interior, while Wasp was shot using reference props to simulate interaction. “The room interior itself was captured as a plate but also scanned in 3D, so we could easily recreate the shots that required a virtual camera move and to manipulate the ceiling when Ant-Man slams into it,” explains Kevin from Luma. 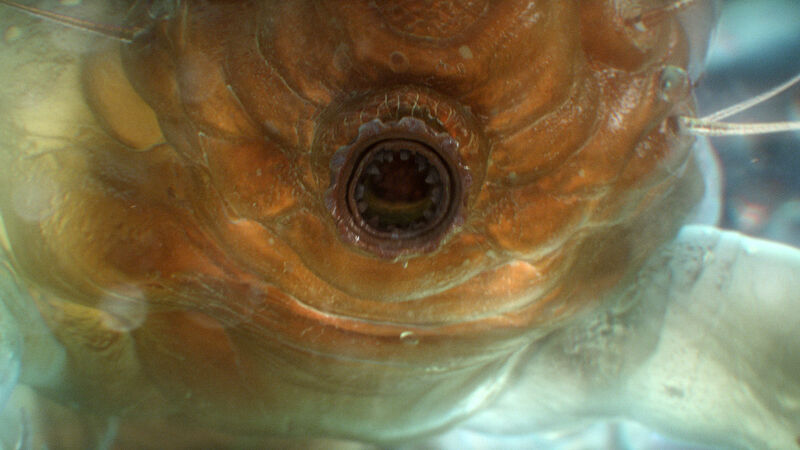 The pieces were individually tracked and match-moved while another camera was created to re-film the scene and compensate for the different field of views of each acquisition camera. 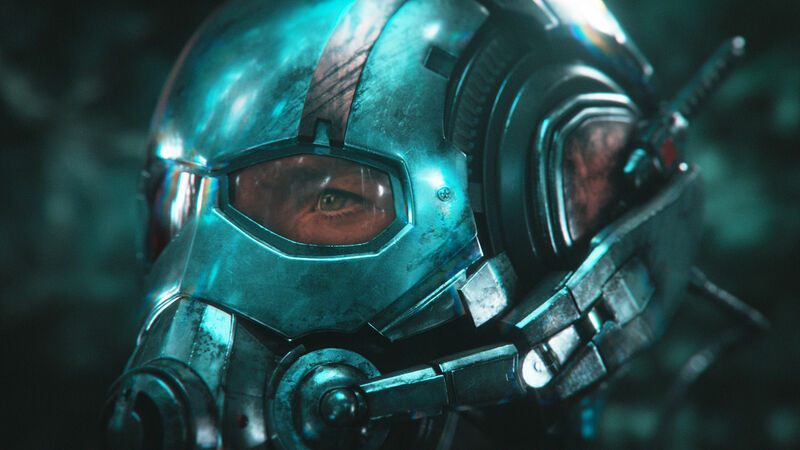 Luma then replaced pieces of Ant-Man’s body with a high-resolution full CG asset, and the resulting mix of photography and CG was a key tool Luma used to help trick the eye and maintain all the subtle comedic performances from Paul Rudd et al. Finishing up his chat, Peyton let us in on a little secret regarding his desire to 'out do' the giant version of Ant-Man seen in Captain America: Civil War. "That was a big thing, it really stuck in my craw for a long time," Peyton laughs. "I was really trying to come up with new, weird ways, and you know, I think he hit about 65 feet in Civil War. We took him to 85 feet; that was a big thing. We also present him in different environments. He gets exhausted and falls, and he's under water. It was just coming up with different ways to use that technology visually." Ant-Man and the Wasp is out now in cinemas across the UK; read the review on our sister site Tech Advisor.